"I want to be up there, that's part of me!" Netflix has launched an official trailer for a documentary titled Mercury 13, made by filmmakers David Sington (In the Shadow of the Moon, The Fear of 13) & Heather Walsh. This doc profiles women who were tested in 1961 for spaceflight, but had their dreams dashed when only men were chosen to become astronauts. On April 9, 1959, NASA introduced their first astronaut class of all men, Mercury 7, to the world. This is the story of the 13 women who were just as deserving of their place in space. I'm sold already based on that pitch alone. I'm sure I'm not the only one thinking, "I didn't know anything about these women?" Perhaps that's the way NASA wanted it to be, but now we get to learn their story. This looks like a great doc to watch when it's out. And I'm a big fan of the poster artwork below. 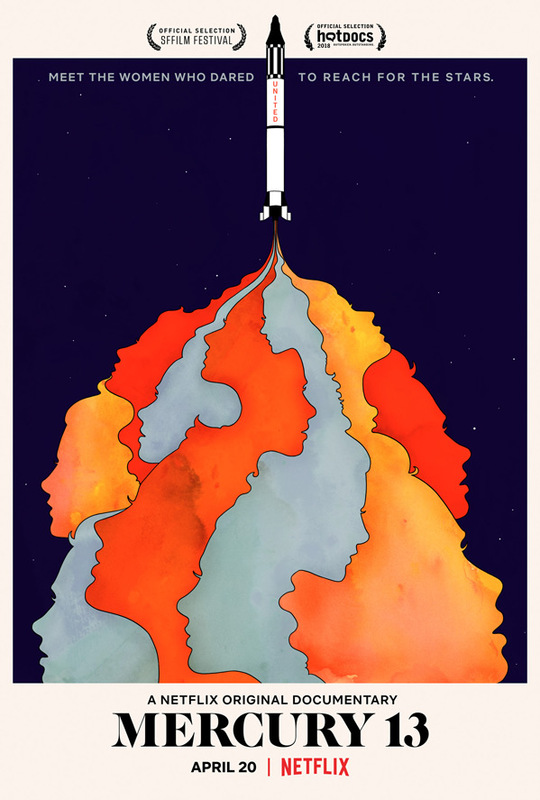 Mercury 13 is a remarkable story of the women who were tested for spaceflight in 1961 before their dreams were dashed in being the first to make the trip beyond Earth. NASA’s ‘man in space’ program, dubbed ‘Project Mercury’ began in 1958. The men chosen – all military test pilots – became known as The Mercury 7. But away from the glare of the media, behind firmly closed doors, female pilots were also screened. Thirteen of them passed and, in some cases, performed better than the men. They were called the Mercury 13 and had the ‘right stuff’ but were, unfortunately, the wrong gender. Underneath the obsession of the space race that gripped America, the women were aviation pioneers who emerged thirsty for a new frontier, but whose time would have to wait. The film tells the definitive story of thirteen truly remarkable women who reached for the stars but were ahead of their time. Mercury 13 is co-directed by filmmakers David Sington (In the Shadow of the Moon, Thin Ice, The Fear of 13, Licence to Krill) & Heather Walsh (producer making her directorial debut). Netflix debuts the doc streaming exclusively starting April 20th.